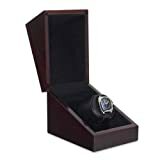 The Orbita Sparta 1 Deluxe Lithium totally enclosed in suede-lined wood cases, with a balanced lift-up top to facilitate watch mounting, this SPARTA 1 DELUXE LITHIUM watchwinder provides complete protection for a valuable watch. Orbita Sparta 1 Deluxe Lithium an elegant and lustrous black piano finish or the attractive mahogany finish. Orbita Sparta 1 Deluxe Lithium winders are factory-fitted with two ORBITA Lithium batteries which will provide a minimum of five years of battery service life...guaranteed. Orbita Sparta 1 Deluxe Lithium watchwinder AC-powered, totally silent version,is also available on special order.